We want to thank all those who have joined us at our events in 2016! Together We Can "Save The Tavern!" Thank you for your part in keeping the Tavern alive. Below is a record of our 2016 events. We are looking forward to more events in 2017!! Enjoy an evening filled with food, wine & LIVE entertainment! $25 Ticket includes appetizers & wine tasting at Grand River Cellars in Madison. Music Trio, Celtic Union, will entertain us with traditional Celtic and Civil War music. Evening will include Chinese & Silent Auctions. Funds raised will go toward the ongoing efforts to "Save The Tavern!" Interested in donating to the Auctions? If you would like to donate an item or basket to this event, please Contact Us here. We can also be reached at UnionvilleTavernEvents@gmail.com or by phone at 440-417-8299. Join us at the Tavern during the Annual Around The Block Antique & Flea Market in Unionville on May 7th. The Tavern Gates will be open from 9am-4pm for guests to wander the grounds and check out the project progress. Also included in the day: Bake Sale complete with CORN FRITTERS, Society Information, "Save The Tavern!" item sales, Johnny Joo photo display, and a Tavern History display! ​Have questions or concerns about the Historic Preservation of the Tavern? ​Members of our board will be available to discuss the project and future plans for the Tavern. We welcome the opportunity to talk to you about the Tavern. Stop by and see us! Contact the Unionville Boosters for more information about reserving a vendor spot! Wonder what the inside of the Tavern really looks like? Now is your chance to find out! Enter the raffle for a chance for you and 3 friends to tour the Tavern before restoration begins! Members of the Board will give you a private guided tour of the Tavern and explain the stabilization projects implemented at the Tavern, the process of Historic Preservation, and the future restoration of the Tavern. Enjoy light refreshments in the Garden Gazebo following your tour. ​*Must be 18+ to enter. Entries into the raffle must be purchased in person during the Unionville Flea Market on May 7th, 2016 between 9am-4pm. Winner need not be present when the winning ticket is announced. Winner and his/her guests (up to 3 additional adults) must be willing to sign a volunteer/visitor release form and agree to all safety guidelines and restrictions prior to the guided tour. Guided tour must be scheduled 3 weeks in advance and is subject to availability of TUTPS board members and volunteers. May is Historic Preservation Month. Help us to promote the Unionville Tavern through the "This Place Matters" National Trust Campaign by participating in a group photo in front of the Tavern at 12pm, Noon. Be there and "Show Your Love" for the Old Tavern! ​Visit SavingPlaces.org for additional information on the National Trust for Historic Preservation "This Place Matters" national campaign to promote Preservation Month. With support from Ohio Humanities, and in partnership with the Lake County History Center, we are offering a drive-it-yourself UGRR Heritage Tour through Eastern Lake County. Join us for a day of presentations, tours, and education to discover confirmed Underground Railroad sites. The day will begin at 12pm at the History Center where Cathy Nelson of the Friends of Freedom Society, Inc. will discuss Ohio's Underground Railroad. Visit St. Johns in Painesville to hear their choir sing at 1:30pm. The Unionville Tavern Preservation Society will host a program at 1:30pm and again at 3:00pm, with ongoing displays and activities from 12-5pm. Continue the tour to various other sites that including the Fairport Harbor Lighthouse. Maps for this event are PRE-SALE ONLY and available through the Lake County History website HERE. ​The day concludes with a BBQ dinner from Crooked River BBQ and a dramatic reading of the Milton Clarke story. UPDATE: Dinner is Sold Out! Due to the overwhelming interest, we are considering offering additional Dinner Theater dates later this year. STAY TUNED! ​*Please understand that while we will provide interpretations of the Underground Railroad at the Unionville Tavern, we are unable to allow access to the building and actual tunnels on the day of the event. Join us for a celebration of preservation! 100% of proceeds received from the Car & Craft show will go towards the upcoming project at the Tavern. Complete the registration form and postmark by July 16th to ensure your desired event t-shirt size! $10 entry donation includes event t-shirt, dash plaque, 50/50 ticket, chance to win an award, and more! T-shirt and dash plaques while supplies last on the day of the event. Pre-register to ensure your FREE event swag! There are still openings for craft show vendors! Looking for handmade, upcycled, & unique arts and crafts. A $20 reserves your 10x10 spot at the show. See Vendor form for additional details. Contact us HERE for more event information. Details coming soon. Visit our Corporate Sponsor page for more information. 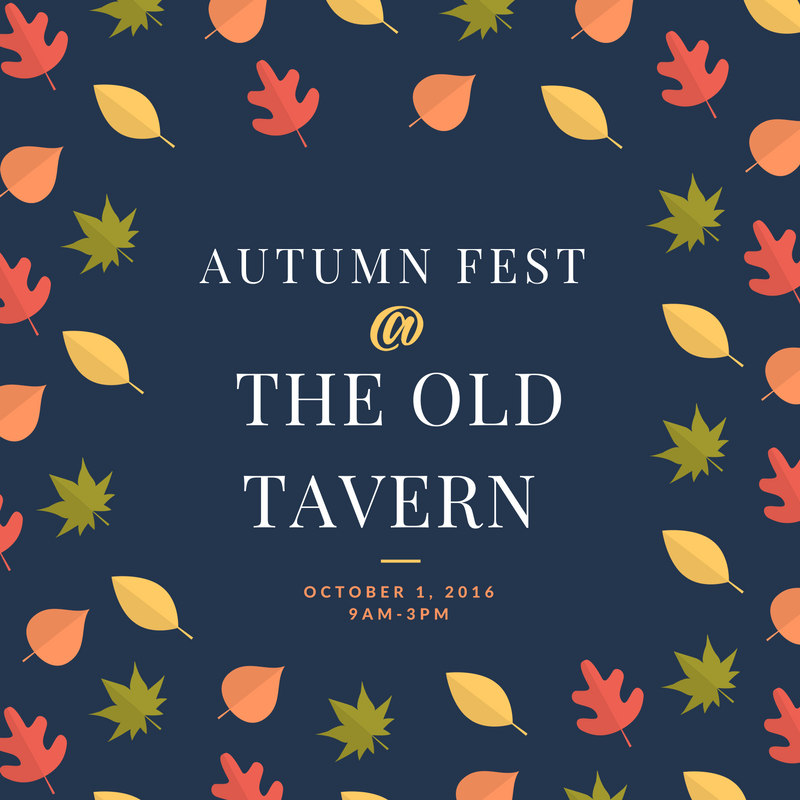 Join us at the Tavern to celebrate Autumn! The gates of the Tavern grounds will be open for guests to explore! Enjoy outdoor displays, handmade crafts& locally grown goods from our vendors, Learn about how the Tavern was constructed in the early 1800's. Food available from Madison Boy Scout Troop 55. The Society is seeking vendors interested in demonstrating their talents and selling their merchandise at our outdoor Autumn Fest on Saturday, October 1, 2016. This inaugural event will draw people to the grounds of the Old Tavern where they can see firsthand the progress made in the long process of preservation and restoration. Originally built in 1798, this building is a part of the history of the Western Reserve, the Underground Railroad, and hosted much fine dining in the past. We welcome vendors who dress in period costume (but this is not necessary), share stories and tell tales of historical interest or simply like to teach the community a little something about their craft or products, in addition to sales. We are hoping to have fresh herb plants and dried herb creations, weaving, yarn spinning, wood carving and wooden toys, quilting and handmade items, perhaps some metal working or forging of hooks and hangers for decorations, and perhaps a person who sharpens tools and knives. Purveyors of homemade maple syrup products, jams and jellies, honey and the like are welcome also. "Meet us at the Barn for a Sweet & Savory Wine Reception, Blind Wine Raffle, & Readings by Edgar Allan Poe"
Tavern Logo wine glass, wine, appetizers & desserts, and performance. Additionally, guests will have the opportunity win a bottle of wine in the Blind Wine Raffle! Raffle tickets available the night of the event. Join us for this unique evening at Rabbit Run Theater! Dramatic Portrayal of Edgar Allan Poe by Literary Historian, and living history performer, Rob Velella. Mr. Velella's portrayal is based on 15+ years of study of Poe's writings. Velella will entertain questions from the audience following his performance. *Please note that although the event name honors one of Edgar Allan Poe's most recognized narrative poems, The Raven, the content of the dramatic portrayal is at the performers discretion. The Society cannot guarantee that "The Raven" will be recited on the night of the event. Join us for another night of food, friends, and fun! Tickets are $10 and include a dinner of spaghetti, salad, dinner roll, and dessert. Evening will include Door Prizes, Chinese Auction, 50/50 Raffle, and more! Proceeds for this event will fund the on-going effort of The Unionville Tavern Preservation Society to "Save The Tavern!" This event has sold out the last 2 years!! Get your tickets NOW while you still can! See you there! Donate a basket to the Chinese Auction! We are seeking baskets for the Chinese Action. This is a great opportunity to highlight your business and/or show your support for the Unionville Tavern! The past 2 years this event has sold out at 300 tickets!! Any donation is appreciated. Please see flyer below or contact Michelle Gerred at UnionvilleTavernEvents@gmail.com , subject: SPAGHETTI DINNER, or call (440) 417-8299.